This is an addition to an earlier post about mastering: Mastering for yourself. This is going to be a brief one but if you are into doing mastering yourself or only for yourself, you will want to know about this and apply this to your workflow. Ever heard about mixing into a bus compressor? If not, no problem, I will tackle that idea soon in an upcoming article. That is for the mixing stage though, similar principles but we are talking about the mastering stage now. Let's look into it. One of the big parts in mastering is to make a song loud enough for whatever the final result has to be. That is dependent on the medium on which it gets released, on the style of music and the condition of the source material. To achieve the loudness you are sending the signal into a limiter to catch its peaks and reduce them to get a bit of space and to make that gain up for more loudness. Not peak level but loudness. That principle is clear, yes ? When I wrote my "Mastering for yourself" article, I explained methods, devices and a good order of the chain and where in the chain to place the limiter, namely, at the end of your processing, after your EQ or your compressor or your stereo manipulation (etc). First of all, that change of loudness early on in the session can reveal issues with the song that you might not hear in a quiet song...and those issues are what you are trying to find and erase. And do you really want to start all over with your tweaks after limitation/loudness applied ? And second, you want to hear how your tweaks and changes sound on a loud song. So why would you make changes on a quiet song and then try to find out if and how they work on the loud version when you can have the loudness right away and tweak it directly ? Let me try to show you what I mean. 1. When I master a song, what I do often is loading up a former mastering session, then I deactivate the devices but I leave the limiter on and set it to a basic amount of limitation before I do anything else or even load up a song. By now, after all the years, I know very quickly where I want it to sit and I can always slightly adjust it anyways. 2. 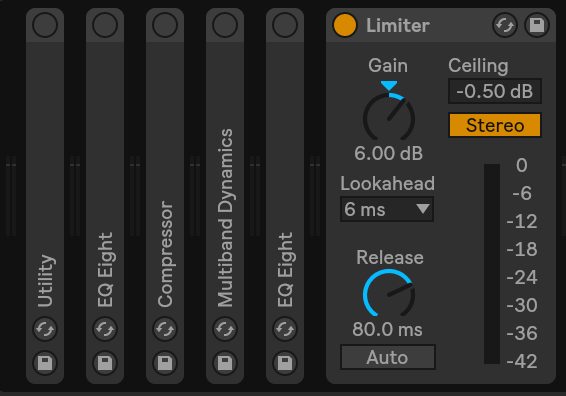 Then I do in fact load a song :) And before the real processing begins I use the limiter and aim it towards the gain reduction and loudness that I have in mind for the song. I want a more or less rough idea of how it's going to finally sound before I start working on it and I want to know how my tweaks sound when the track is where I would like it to be - loudness wise. 3. So when the limiter is set up, then I go on to null my devices, delete the old settings to get a fresh start with the new song and I switch the devices on to start the real processing. ...is that you might be misjudging the song, its potential issues/weaknesses or your tweaks. You might misjudge how much bass the song has/needs, you might misjudge how much treble the song has/needs. And then the great revelation follows when you switch on your limiter to make it louder. See it as a change of perspective when you switch it on. Then you have to go back and tweak again...or even get confused or frustrated with it.